Annual Faith & Fitness Events! 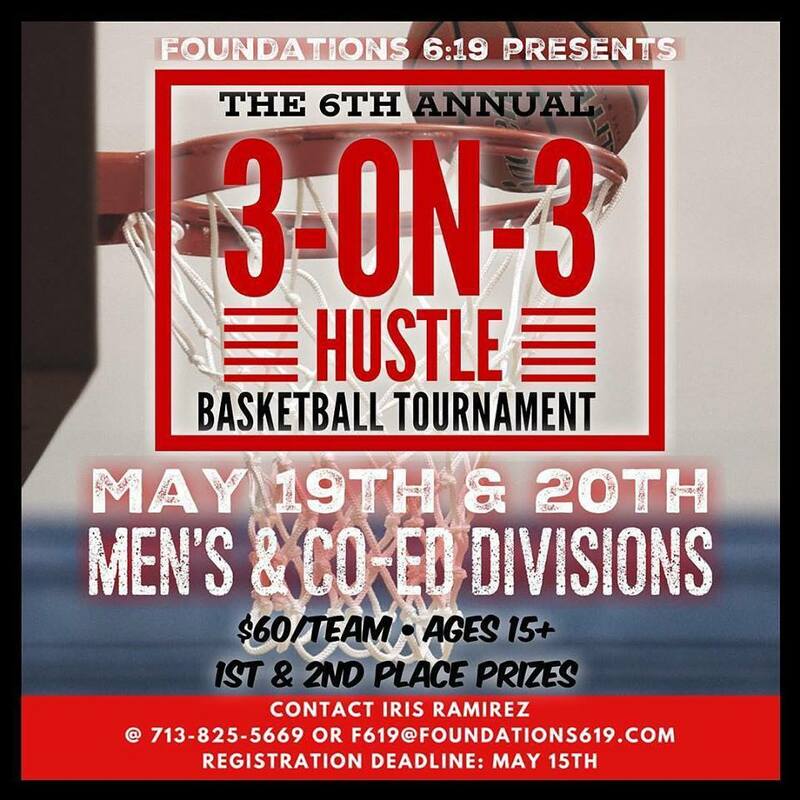 Every year we host a 3v3 Basketball Tournament and 10k/5k Honor Run to raise monies for our facilities, equipment, and services. Charitable Cause as a way for us to give back to our community! 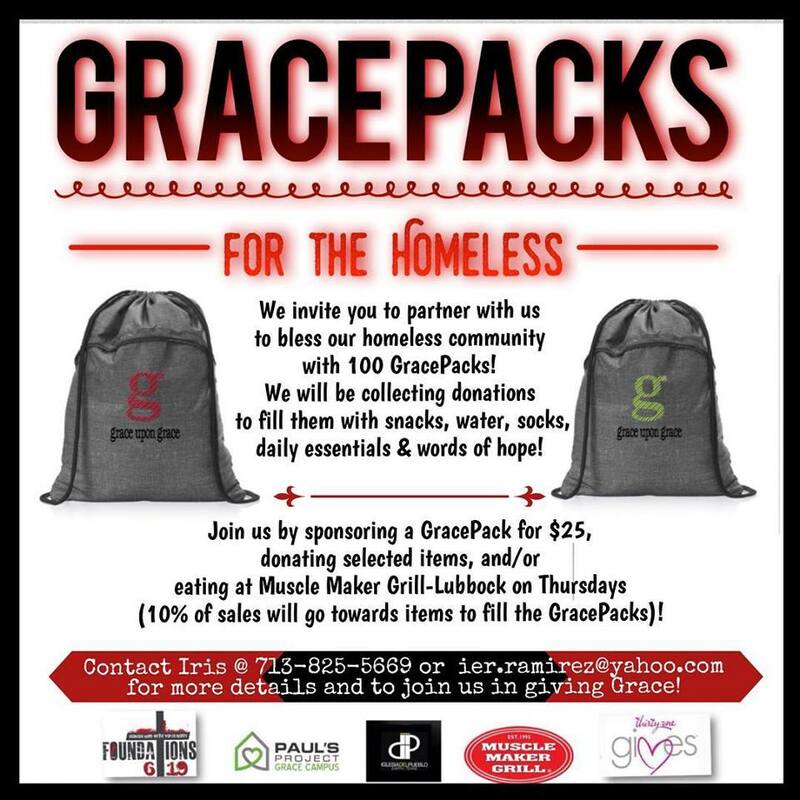 We are so excited to partner and unite with our church IDP, Earth, @all_in_fashion31, @muscle_maker_lubbock and our local churches & community to collectively #giveGrace to the homeless community of Paul’s Project-Grace Campus!! We are now collecting donations and sponsorships for these #GRACEpacks to be distributed next month! You can sponsor a bag for $25, which will include the cost of the personalized bag, essentials to fill it (socks, hand lotion, chapstick, water, snacks, wipes and first aid items) and a prayer of encouragement! We invite you to join us in #givingGrace to these amazing people who all have a special story and are precious in God’s sight! 1) Sponsor a bag for $25! Just message me for details. If you are part of an organization, such as a gym or church or business, possibly consider sponsoring more than one as a group! 2) Donate items to fill the #GRACEpacks. Please message me for the items we may need at the time of your donation. 3) Eat Healthy on Thursdays! Of course we want you to eat healthy daily, but on Thursdays, Muscle Maker Grill is donating 10% of purchase towards the #GracePacks! and/or desire to be a part of this #gracemovement! ​You can also make a monetary donation! Please use the link below and include #GracePack in the description. to an elementary school and another 50 to a church community! Thank you for partnering with us to make a difference and share God's love to make others Stronger! As we pray for Texas, we have been torn about what we can do to help!! We will also be creating These Texas Strong Sacs!! 1. Survivors have NOTHING except what they escaped with. And will not have anything to carry their new essentials in, and these cinch sacs are durable and easy to carry. Sponsor one for $20 and I will use all commission and local donations to fill each one with toiletries and snacks! 3. Our desire is to get these to the people you know need them!! Use the DONAT link above to sponsor a TEXAS STRONG SAC or make a donation! Local friends and family, you can bring the following to the Foundations 6:19 gym in Earth! Blessings and thank you for partnering with us!! 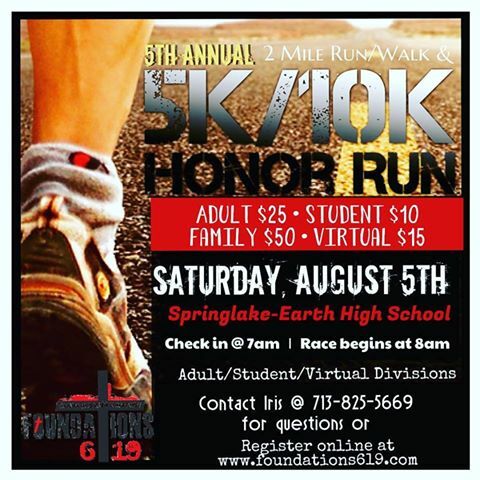 FOR OUR ANNUAL HONOR RUN! All runners should begin checking in @ 7AM to receive their bibs, pins and to warm-up. give back to FOUNDATIONS 6:19! We will be using a portion of proceeds to begin our new FITNESS FUND (more info coming soon), and the remainder towards projects in the F619 GYM. And every one of our members who made a donation! ​and everyone who came out to support! 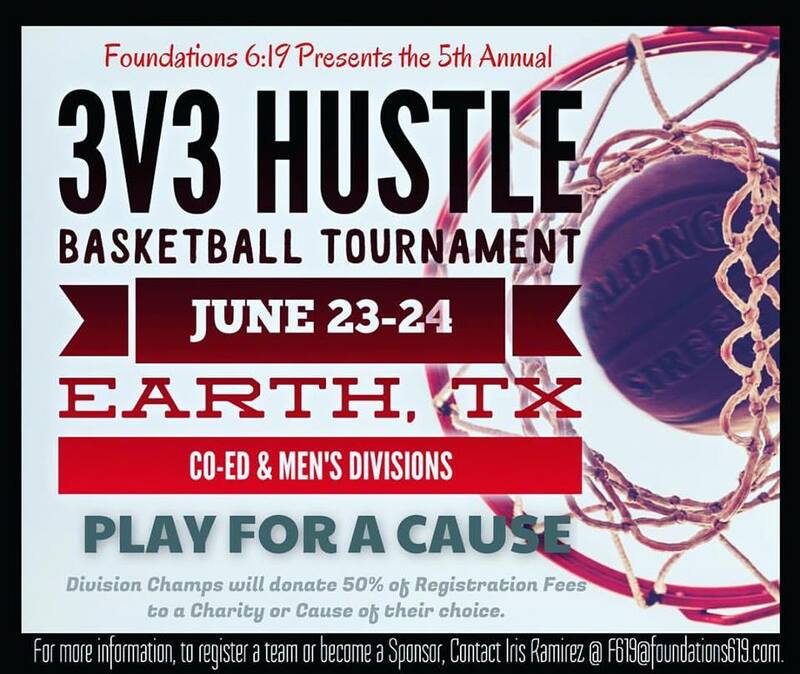 ANNOUNCING OUR 5TH ANNUAL 3V3 HUSTLE BASKETBALL TOURNAMENT!! We sincerely thank you for all your support over the last FOUR years! finally fulfilled our vision in establishing our F619 Faith & Fitness Center here in Earth, TX. to be healthy and honor God with their bodies! to donate 50% of proceeds to their Charitable Cause of Choice!! or from our LOCAL LEADERS! our faith & fitness center, attached below or I can email you one too! or download the appropriate forms below! PLEASE JOIN US and SHARE!! Manny Ramirez, former NFL offensive lineman, will also be giving FREE autographs at the end of the tournament! This NEW YEAR, as we resolve to be better and get healthier, we invite you to unite our efforts to also FIGHT BACK against cancer! 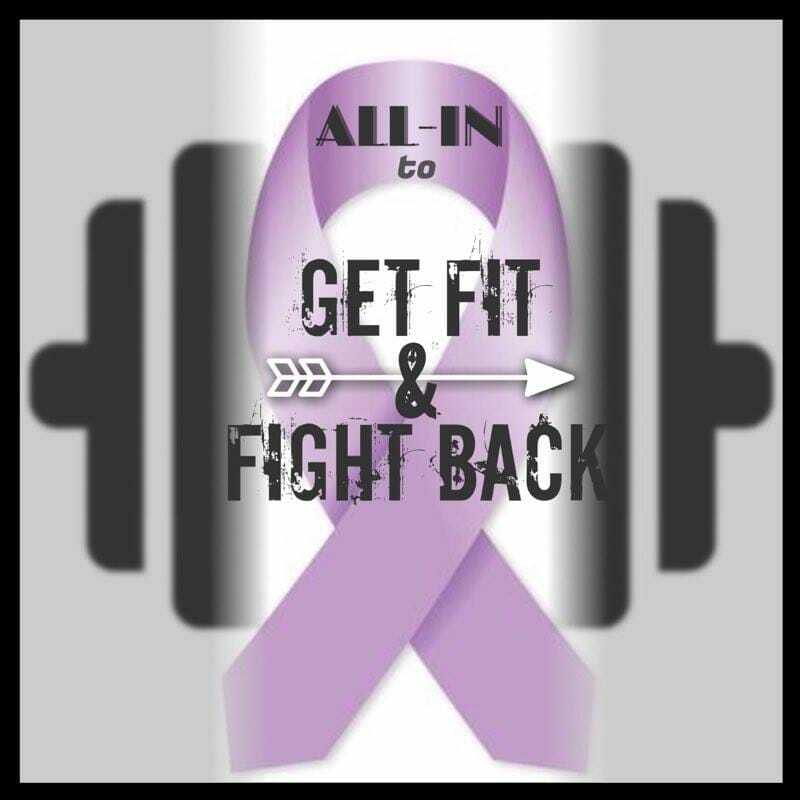 Join us for our 21-day Challenge to go ALL-IN to GET FIT & FIGHT BACK! We will commit to being consistent in making healthy habits while also encouraging our loved ones with hope! Fifteen percent of registration fees will be added to our new FIGHT BACK FUND, which the WINNING TEAM will use to bless the Charity/Cause of their choice! For questions or to sign up, please contact us at f619@foundations619.com! **WE DONATED $500 TO TYLER BOSMAN FOR HER DAUGHTER ANGEL'S MEDICAL BILLS.